Kathy and I have been fortunate to run rivers throughout Idaho, and if we were to pick a handful of the top paddle trips in the state, this one would clearly be on the list. 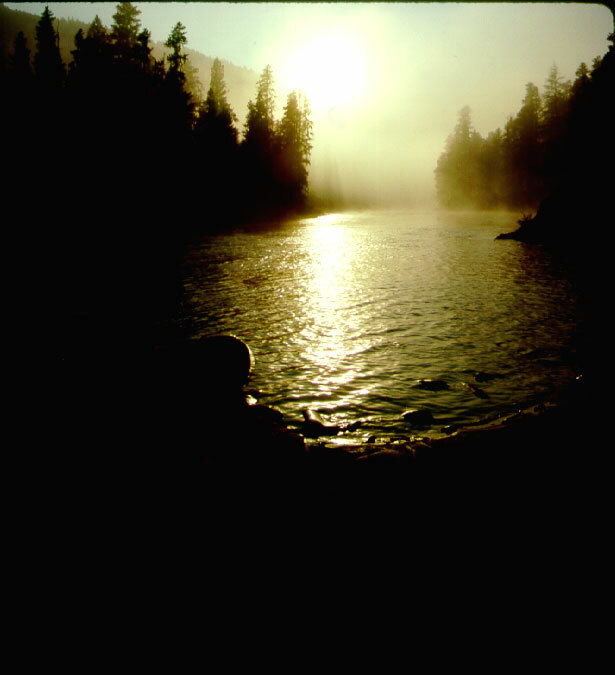 The scenery, crystal clear water, and an air permeated with the aroma of a northern Idaho evergreen forest adds up to one full-flavored paddling treat. It's not quite a beginner's jaunt, but with a little experience under your belt, it's a fine run, well seasoned with a liberal sprinkling of flatwater and a pinch of class II water to give it just the right amout of pizzazz. Difficulty: The upper third of the run is 1.4. Chipmunk Rapids is Class II (rated at 3, 500 cfs). The lower third is 1.3. For information on ratings, go here. Distance/Time: 16.3 Miles / 4-5 hours at 3,500 cfs. Getting to the Put-in. Dickensheet Campground. From the town of Priest River, drive north on Idaho 57. At approximately 25 miles from Priest River, you'll come to a junction with the road to Coolin. This junction is the so called "Dickensheet Junction." Take a right here and head towards Coolin. The road swings around in a big "U" and about 1 mile from the junction, it passes over the Priest River. The put-in at Dickensheet Campground (river left, downstream of the bridge). Getting to the Take-out. Big Hole. To get to the Big Hole take-out, start at Dickensheet Junction, described above. Roads are not always signed, so you'll want to use your odomoter. Note your odometer reading at the junction and drive 4.5 miles south (toward Priest River). Turn left on the Gleason-McAbee Road Falls Road. Now really watch your odometer. Staying on the main road, drive 3.2 miles. Take a right. There may or may not be a sign indicating Forest Road 334. From this junction drive 2.1 miles to another road junction and take a left. This is the last turn. Continue following this road for 2 miles. Keep your eye out, watching to the left for the river. As soon as you first see the river, look for a small pull-off on the left, just big enough for two or three vehicles. This is where you leave the shuttle vehicle. From this pull-off you'll find a trail which leads down the river (about 200 feet from the road). Before driving off, hike down to the river and tie a ribbon or colorful rag to a bush at the take out. Big Hole (really it's only a medium sized eddy) is a very non-descript place, and you'll need some sort of flagging to attract your attention. Be sure to do this before leaving. 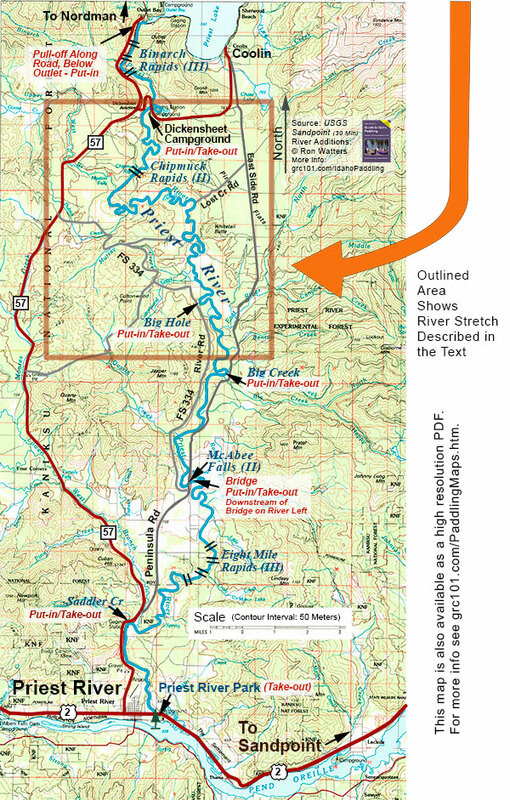 Note that another way of approaching Big Hole (from the Priest River direction) is described here. The Trip. This outstanding paddle trip begins in primitive surroundings with little sign of civization. When we ran the river in late June so many daisies lined the bank that they looked like a hovering white halo. Behind the daisies is the shadowy forest of mixed conifers. The scattering of cottonwoods announced themselves to us with a snow squal of floating cotton seeds. Except for one rapids, this is primarily a flatwater float, though there are places here and there with waves and some fast corners. As long as you use the accepted river running technique of entering corners on the inside, you should be in good position to pass by safely. The one rapid, Chipmunk Rapids, comes 3.6 miles into the trip. You can tell when you are approaching Chipmunk. On river right is a 200-foot high cliff that has sluffed off and is clear of trees. And on the left side a primitive road comes down to the bank of the river. It's the first road that you'll see on the left. When we ran the river at 3,800 cfs, the rapids began with a long rolling wave - which was actually a wonderful surfer. The wave extended 2/3 across the river from the left shore. We missed it in our canoe, doggone it, but you'll want keep it in mind on your trip. At our water level, there was no curl-back to the rolling wave and it was a fun up-and-down ride over it. There were a few more waves after the roller, but we didn't find anything of significant concern. Shortly after Chipmunk rapids, things slow down. The next obvious landmark comes at the 5.1 mile point: a large island with trees. If you are running the river in low water, the shallower left channel around the island will probably be dry, but it should be obvious that it's an island in higher water. At this point, you are not quite at the halfway point. You'll likely see bald eagles and osprey. We saw both on our journey. If you miss out seeing those, we can guarentee that you'll see cliff swallows, ever busy and showing off their aerial skis, swooping up flying insects off the surface of the water. Shortly after the island, you'll start seeing signs of civilization: a few scattered homes. By mile 11, the forest has receeded and you'll reach open fields, a farm or two and houses sprouting up here and there. Just before your take-out at Big Hole, you'll pass a structure adjacent to the river on the right. At this point, you are only .3 miles from the end. Since it's easy to slip by the take-out, you'll want to keep an eye out for the flagging that you left at Big Hole. You'll find an eddy on the right just above the take-out (we guess that eddy is how "Big Hole" got it's name, though it seems likely that eddy must have shrunk in size over the years). Though not huge, the eddy is, nevertheless, a decent stopping place. The landing area on the shore, however, is small. If you have several in your party, you may need to float around in the eddy until the boats are dragged up and out the way. When everyone is off the river, remember, in the spirit of "Leave No Trace" to remove your flagging. Shuttle. 13 miles, some paved, some dirt. Bike shuttle possible, but be prepared for narrow shoulder and heavy traffic on the 5.5 miles of highway riding.